The burger is topped with PA Noble Aged Cheddar, bacon mayonnaise (!!!) and comes with lettuce, tomato, red onion, and a house-made pickle & chips housed under a shiny, brioche bun. The burger was cooked perfectly medium and was nice & juicy. And the bacon mayo? OMG! How did I ever live life before without this? I know that the whole “bacon fad” is still kind of a lingering thing, but this was solid – tasty & amazing – really enhancing the flavor of the burger without overwhelming it with a bacon-y taste. All the ingredients were fresh and local. I was completely blown away by this burger, as well as all the beers Forest & Main had on tap. The suburban burger bar has been set so high straight out of the gate that I feel ready to embrace any future disappointment. 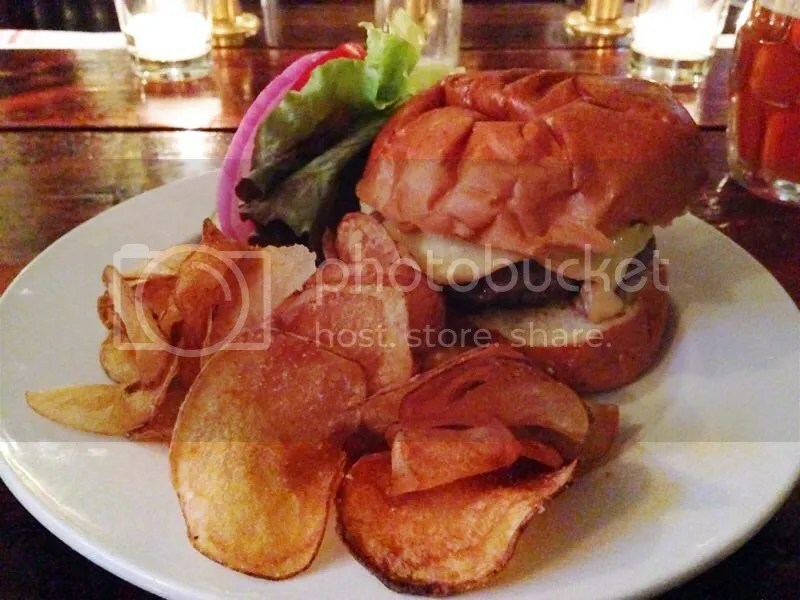 Get yourselves on a train from Center City as soon as possible and come try this burger now! Posted in bacon, bacon mayo, beer, brewery, brioche, buns, burger, Forest & Main, Montgomery County, Suburbs. Bookmark the permalink. Not many “A” ratings handed out by our trusty burger critic, so I’ve got this joint on my calendar when next I visit the greater Philly area. Thanks for the heads up!